Anchor Bay Bicycle & Fitness opened its doors for business in May of 1996. 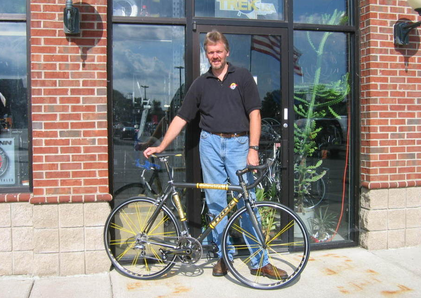 Owner, John Trexler, began his career in 1972 at Jake's Bike Shop in Harper Woods. It was there that he developed his passion for the sport of cycling. In addition to acquiring mechanical skills and mastering the art of wheel building, he helped construct the Madison Velodrome indoor board track, raced in the Debaets-DeVos Memorial Races at Chandler Park, and always looked forward to the Wolverine 200 Bike Marathon on Belle Isle every spring. Our Mobile Services started in October of 2011. 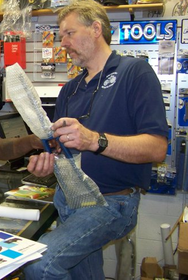 This service allows us to come to you for you bicycle and exercise equipment repair needs. 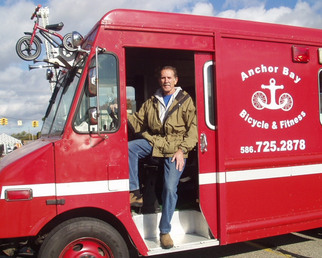 Al Lauland brings this service to Anchor Bay Bike with his converted Detroit Fire Truck. The truck is outfitted as a bicycle shop on wheels. Al has years of cycling and bicycle repair experience and is a certified cycling instructor. He races mountain bikes, participates in the annual Pedal Across Lower Michigan (PALM) week-long ride as their Bicycle Education Chairperson, tours self-contained on his bike, and rides thousands of miles per year. After working for another eastside bike shop until 1996, John opened his own store in New Baltimore, Michigan. John continues to be passionate about cycling. He is always happy to share his knowledge and skills with fellow cyclists. Vintage bicycle repair is one of John's unique service specialties. His vast knowledge and skills make him one of the few specialized dealers in this area who repair and restore vintage bicycles.